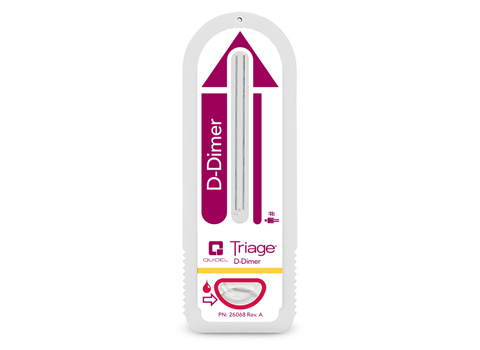 The Quidel Triage D-Dimer Test is a rapid, quantitative immunoassay to aid in assessing and evaluating patients with suspected disseminated intravascular coagulation (DIC) and thromboembolic events including pulmonary embolism (PE) and deep vein thrombosis (DVT). 1. Dempfle CE, Zips S, Ergul H, Heene DL. The Fibrin Assay Comparison Trial (FACT): Evaluation of 23 quantitative D-dimer assays as basis for the development of D-dimer calibrators. Thromb Haemost. 2001;85:671-678. 2. Stein PD, Hull RD, Patel KC, et al. D-dimer for the exclusion of acute venous thrombosis and pulmonary embolism: a systematic review. Ann Intern Med. 2004;140:589-602.